The Edens Bluff seed bag. Photo by David Dye. In 1932 Dellinger’s crews excavated the Edens Bluff Shelter in Benton County, Arkansas, along the White River. Among the other interesting artifacts found at the site was a bag of seeds. 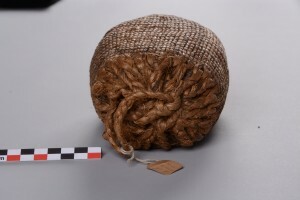 This woven bag contains about a liter of seeds from a domesticated but now extinct starchy-oily seed plant called Chenopodium berlandieri subsup jonesianum (goosefoot), and smaller amounts of an unidentified Asteracae. Today the wild ancestor of this lost crop, Chenopodium berlandieri, can be found growing along riverbanks and field edges across much of North America. This was a plant first collected by Native American hunters and gathers and domesticated independently in Eastern North America in the Late Archaic and later in Mexico. It is related to quinoa (Chenopdium quinoa) which has recently become popular again, and while the Eastern North American domesticate went extinct, the later Mexican domesticate Chenopdium berlandieri sup. nuttallie is still an important crop. 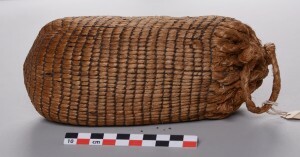 A radiocarbon date of approximately AD 20 was obtained on a sample of seeds from this bag. The dates for this sample are comparable in type and age to chenopodium found in sites in Kentucky and Alabama. The bag itself is an example of twining; the process of making a textile by twisting two cords or elements around each other in between successive elements that make up the “warp” of the textile. In the case of the Edens Bluff bag, the “warp” elements are unspun bunches of the vascular bundles processed from the leaves of Eryngium yuccifolium (rattlesnake master), while the twining elements have the same characteristics as retted inner bark of the Pawpaw (Asimina triloba) tree. 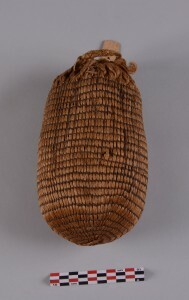 This specific type of textile, common from Early to Middle Woodland in the Ozark Plateau, has a dense surface with few opening between the elements, making it well suited for the creation of bags to transport and store small seeded crops. 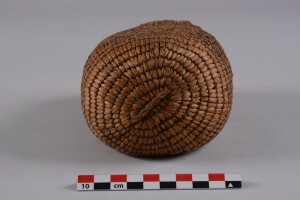 The ancient farmer who filled the bag with seeds also stuffed a small amount of loose rattlesnake master fiber into the top before pulling the drawstring closure tightly shut to keep the tiny seeds from spilling out. Paleoethnobotanists study the use of plants in human history. They are particularly interested in where, when, and how humans went from gathering wild plants to selecting and changing plants through domestication, and how this transition changed societies. Native American hunters and gatherers knew a lot about wild plants and began to select and encourage plants with particular traits. For example, grains with larger seeds or a thinner outer seed coat would be an easier food source to process and more reliable to cultivate. Paleoethnobotanists can track these changes through time and tell if a plant found archeologically has been altered by human selection to the point that it has become domesticated. They can also track these changes, as well as different varieties of the same plant, geographically to trace its movement through trade or diffusion. This bag of seeds from Edens Bluff tells us a small piece of the story of plant domestication in southeastern prehistory. This is one of many samples of chenopodium found in bluff shelter sites in the Ozarks. Bluff shelters contain large samples of seeds from single storage events and because of dry conditions the seeds, and frequently their storage containers, are well-preserved. 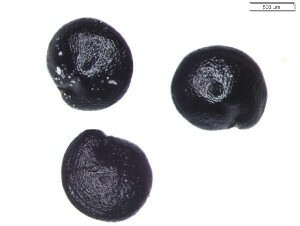 On an open archeological site carbonized seeds can be recovered through special collection techniques but the burning events that lead to their carbonization damages and alters the shape of the seeds. Large samples found in bluff shelters not only allow us to see these important crop plants unaltered by carbonization, but as the study of ancient DNA and genomics improves, even trace their genetic histories from wild resources to crop plants. All of this helps piece together the story of when and where particular plants were being domesticated and how this changed the course of human history.